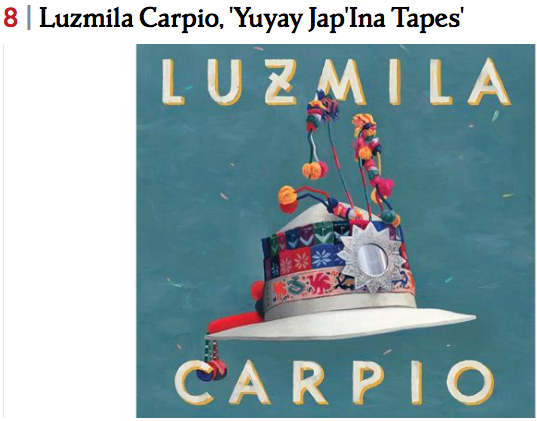 Our Luzmila Carpio among the 10 best Latin Albums of 2015! 2015 was a year of Latin fusion. Pitbull’s bilingual joyride Dale triumphed the Latin Top 40, while Natalia Lafourcade raked in five Latin Grammys with her huapango-infused balladry. Long-time electro-cumbia favorites Bomba Estéreo signed to major label powerhouse Sony Latin, while Afro-Cuban chanteuses Ibeyi made unprecedented moves as a breakout act. Latin music, in all its colorful, multi-faceted splendor, has never been so eclectic, and so incredibly strong. Here are the best sounds from Latin America — and its various diasporas — in 2015. Once the Bolivian ambassador to France, Luzmila Carpio is arguably South America’s most prolific indigenous artist. Originally recorded in 1990, the Yuyay Jap’Ina Tapes — translated to “reclaim our knowledge” — began as a collaborative effort with UNICEF to preserve the indigenous Quechua language through song. Excavated and released this year by French label Almost Musique, each song is characterized by brisk, tightly wound rhythms, procured not by drums, but by an ensemble​ of bells, birds, woodwinds and Andean lute​s,​ or ​charango​s. At times it’s even hard to discern what sounds like a pan flute and what is actually Carpio’s near-piercing falsetto. Carpio’s staggering, sky-high timbre can only be reached with an insurmountable level of discipline, cultivated by her near 50 years of spinning tales up and down the valleys of Bolivia. Also notable are the vibrant, electronic reworkings of her songs in the 2015 EP, Luzmila Carpio Meets ZZK, a collaboration with Argentina’s ZZK Records. Homegrown producers such as Nicola Cruz and Chancha Via Circuito put a modern twist on sounds that span millennia. Genre-colonist Diplos of the world, fall back. S.E. 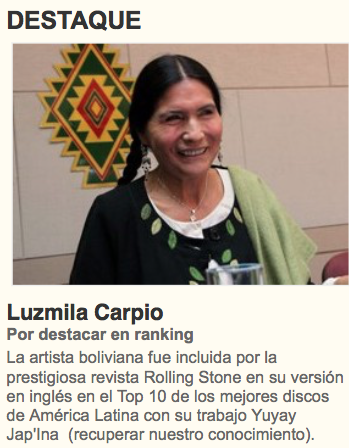 I welcome Luzmila Carpio to The Hall of Bolivian Fame! This entry was posted in Art, Bolivia, Crime and Violence and tagged Bolivian folklore, music. Bookmark the permalink.